Philippinefails: Filipino Cuisine: Eater beware? Some people think Filipino cuisine is horrible. "It's the worst food in the world," they say. Too oily, too salty, too gross. Balut, anyone? I think a lot of the hate for Filipino food is because foreigners are looking for the adventure that comes from eating street food. Eating from a cart can be cheap and delicious. 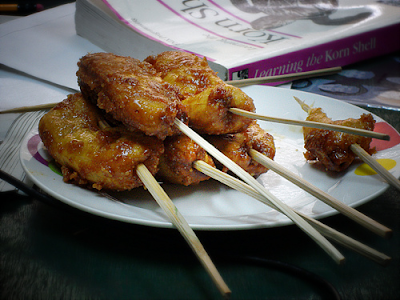 You won't be finding banana cue at a fancy sit-down restaurant. The problem with some street food is that it has been sitting out all day and gets to losing its lustre and flavour. This is a big problem at sari-sari store and roadside restaurants more than anywhere else. Food will be cooked in the morning and left out all day. Gross! The best way to experience Filipino food is to purchase the ingredients fresh from the market and have a Filipino prepare them. Admittedly this is not easy for tourists but for those who live here and still complain about the horrible food, this is the perfect solution. Here below is what I ate on Sunday, April 23, 2017. 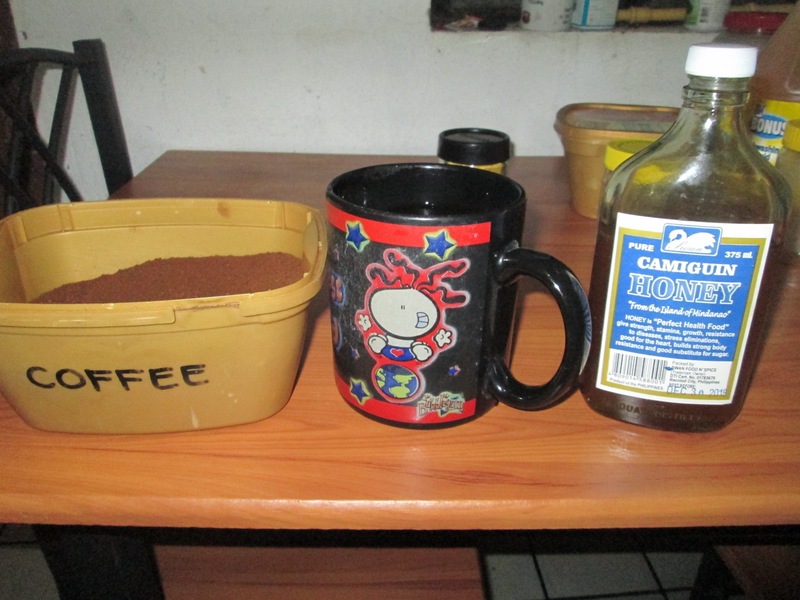 First breakfast is always a large cup of Batangas coffee mixed with honey from Mindanao. This is much tastier than any of those nescafe sachets. 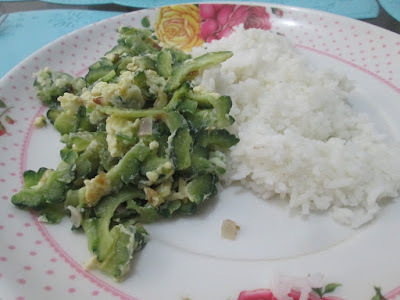 Second breakfast is sliced ampalaya (or bitter gourd) fried with chopped onions, diced garlic, and eggs. 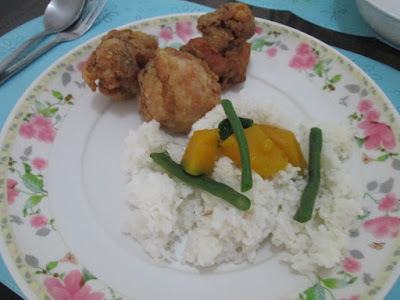 Served with rice. For lunch I ate fried chicken from a street vendor and a vegetable stew called laswa. Also served with rice. In the Philippines all fried chicken is referred to as chickenjoy which is what Jollibees calls their fried chicken. Filipinos tend to call things by brand names. For instance they call "toothpaste" "Colgate." 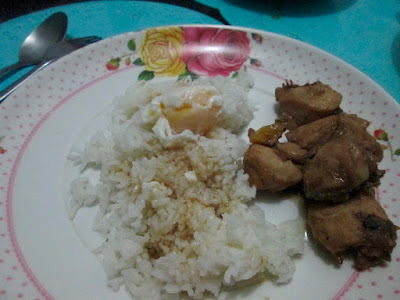 For dinner there was chicken adobo and Nido Oriental Soup poured over the rice. What a delicious day. 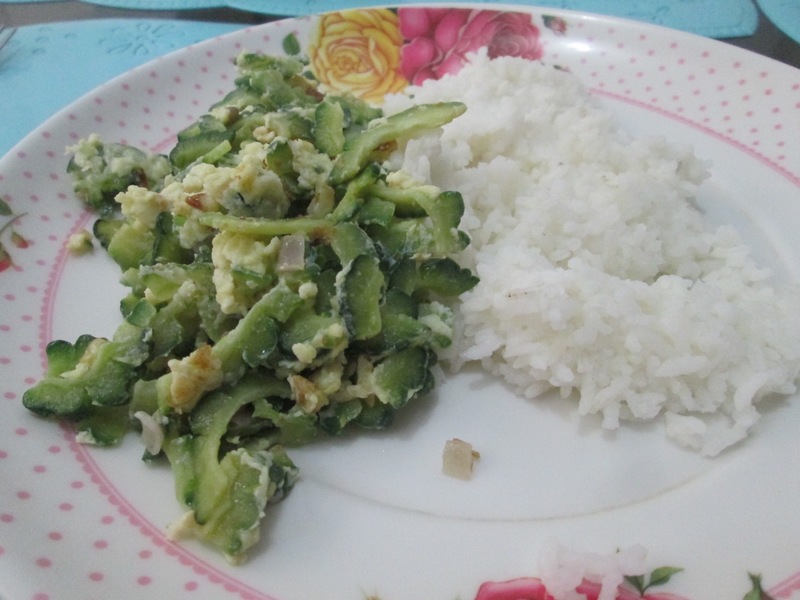 Filipino food isn't so bad if you prepare it from fresh ingredients. And if you give strict instructions to not use so much oil and salt. There is one thing more. Rice for all three meals? Yes. Rice three meals a day everyday. It's a lot of rice I admit. I do not pile it on like others but use just enough to act like a sponge and absorb the juices and flavour of the food. The only time rice is ever a problem is when you bite down and there is a rock! 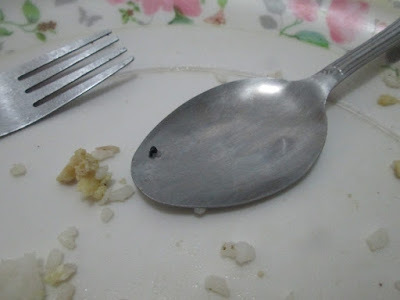 See that tiny black speck on the spoon? That is a rock and many, many times I have almost cracked a tooth by biting down unawares on one.